Do you know what FFA is all about? 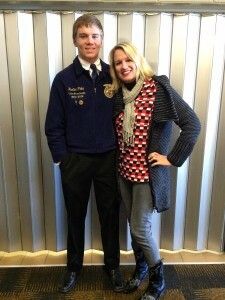 As a mom of a FFA member, I do—but as a student and young adult, I had no idea. I married a small-town boy. He wasn’t raised on a farm, but he was active in his local FFA chapter as a high school student. My husband raves about the confidence and lifelong skills he gained through FFA (unparalleled to the skills he obtained from other organizations and activities). Our son, Hunter, joined FFA as an eighth grader and has been an active member for the past four years. Cows are not required. Neither are plaid or camouflage shirts. You don’t even have to own a pair of cowboy boots. 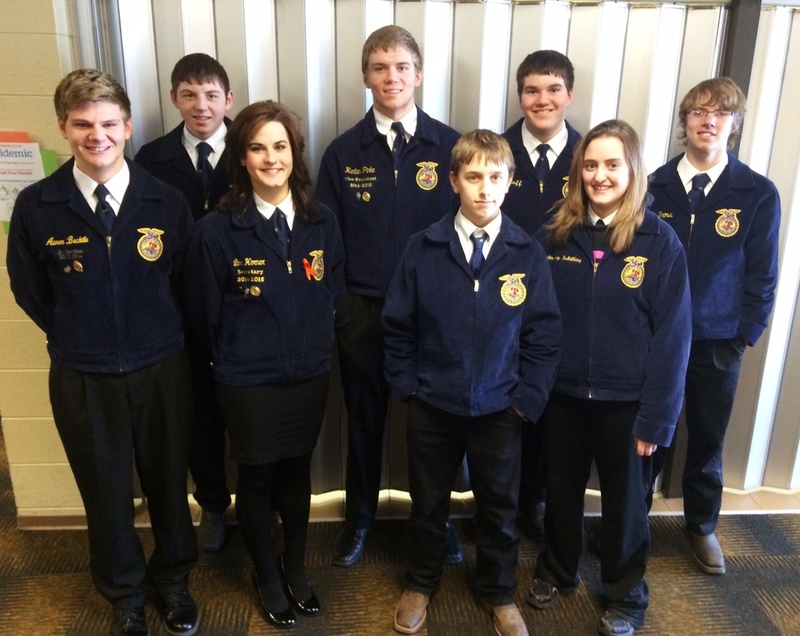 There is an official FFA dress code, complete with the signature blue corduroy jacket that dates back to 1933. The dress code signifies FFA unity and connects each FFA member to the largest youth organization in the world. The blue FFA jackets come together locally, at a state level and at National FFA. It’s exhilarating for kids to belong to and attend National FFA which is second only to the National Republican Convention, as the largest convention in the United States. You belong to FFA with a blue jacket, with or without cows. FFA is not 4-H. They are two strong, yet different, organizations, and my kids are involved in both programs. 4-H is offered through the cooperative Extension service, outside of school. 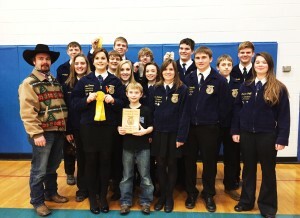 FFA is part of a school’s agricultural education program offered to junior high and high school students. In addition to serving as the FFA adviser, an agriculture education instructor teaches an array of classes based on the interests and needs of the students, such as animal science, veterinary medicine, environmental science, plant science, horticulture, floral design, agricultural mechanics, electricity, robotics, aquaculture, crop science, welding and/or biotechnology. FFA is inclusive. All kids—city, town, rural, farm, shy, outgoing, athletic and musical—are encouraged to join FFA. The world needs more inclusively instead of exclusivity. In FFA, there are not cuts and your kids do not make baskets or score touchdowns. They don’t have a winning record or a losing record. But they are still actively a part of a team. It’s competition with the highest level of integrity, compassion and encouragement of one another I have ever observed, both as a judge for a number of years and as a mom. Plus, your child will learn cooperation, time management, work ethic, how to set goals, research, writing, problem solving and business skills. 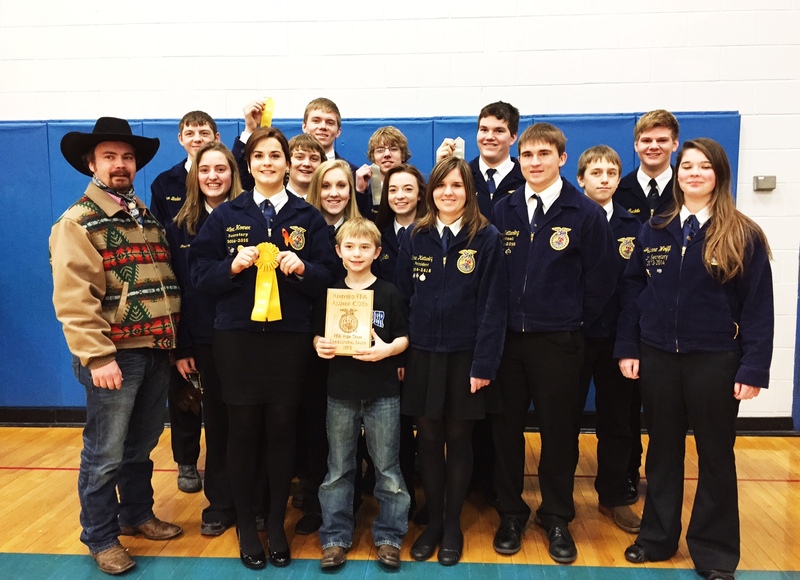 FFA contests are aptly called Career Development Events (CDEs). There are more than 30 CDEs, such as environmental and natural resources, floriculture, food science, ag communications and farm business management. CDEs afford kids hands-on opportunities to test the skills they learn in a classroom in industry-focused, real-world events. There are at least a couple of CDEs that will fuel your child’s passions. Hunter’s first CDE, dairy foods, was not his forte. Testing milk made him sick to his stomach. The next year, he found his passion and voice in the ag sales CDE—and today he continues to sharpen those skills. FFA students learn by doing. Supervised Agricultural Experiences, SAEs, provide hands-on learning that teaches through entrepreneurship, internship or job placement; research or experimentation; and exploring new career opportunities. Hunter’s SAE is working at our family’s lumberyard. He’s learning hands-on skills about products, sales, delivery, accounting and much more. His FFA adviser checks in on him to help him track his SAE progress. FFA members are tomorrow’s leaders. Even if you weren’t in FFA, live in a city, aren’t from a farm and doubt your child will choose a career in agriculture, FFA teaches essential leadership skills that last a lifetime. During my marketing career, the best professionals I hired and worked alongside were once FFA members. 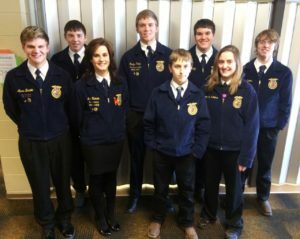 Without looking at their resume, without asking them if they owned a blue corduroy jacket, I could tell they were FFA alum by their poise, preparation and articulation during a job interview. I want my kids to participate in FFA. I want your kids to be in FFA, as well, for the future of our businesses, schools, communities, states and country. FFA is equipping our next generation of leaders. I’m a proud mom to one of those kids. Thank you to all who contribute and work to make FFA what it is today. What does FFA mean to you? Read Why Is FFA Relevant For Our Future for more of my perspective and back story of FFA. Thank you for your support and kind words to my FFA posts. Another great post, Katie! Thanks for being such a great supportive for all of kids that wear the blue jacket! Thank you Amy! I saw our local FFA chapter at contests this morning. It was the right timing to hit publish on this post I had previously drafted. So what does FFA stand for, then, if it doesn’t stand for Future Farmers of America? It does stand for future farmers of America but it also stands for the Future of our society. As the president of my FFA Chapter, I have encountered many people who all have different interest. The CDE’S have more categories that are equipped with numerous activities. Everything from public speaking to judging a plant. This is a very well rounded and a very important club that needs to make an impact as we did many years ago. Yes we raise the animals for the consumer but we grow and learn the basic qualities that a person could take a lifetime to learn. So yes it is labeled as Future farmers of America but it’s also the future leaders that will one day make an impact on everyday lives. The letters FFA do still stand for Future Farms of America but the organization is now known as the National FFA Organization. We did this because so many people where and still are, getting hung up on the Farmers portion of the acronym. Like the article says this organization is all inclusive, doesn’t require cows and is a part of the education system in schools so we wanted to make the name represent that more than it has in the past. Ok, thanks. I am very familiar with FFA. My daughter was her chapter’s President for two years. She went to college & majored in Ag leadership. In fact, she’s the one that posted a link to this article. I just wanted clarification of what the letters stood for since you mentioned that in the article. We are not farmers, but have certainly seen what FFA can do for its members. Thank you for answering my question. This is something not many people know, it does NOT stand for anything anymore! Actually, it isn’t “technically” FFA, it’s the National FFA Organization. In 1988, the FFA changed it’s name from Future Farmers of America to the National FFA Organization to, like the paragraph said, include all students, not just “future farmers.” This was due to the (awesome) phenomenon of more and more urban students joining FFA. They also completed the task by updating the emblem and changing the FFA Creed, a set of 5 paragraphs that write our our morals and principles as FFA members. Most of the older members of my family still calls it Future Farmers of America, which is fine! The goals of the old FFA is the same as the FFA we are a part of today, but now they’re even better! Thank you! We need MANY more ag teachers and FFA advisers! My dad started the FFA where he was an ag teacher the alum association now has an FFA/AG scholarship I set up in his memory. Very familiar with FFA but why doesn’t it mean Future Farmers of America anymore why would that change? Had not heard this. The reason they changed the name is because in 1988 at the National Convention a FFA Member stated that Agriculture isn’t just about farming. Ag stretches into everyday life for everyone. If you work at Walmart you are taking part in agriculture by selling products to consumers. If you are the CEO of Chiles or McDonalds you are taking part in Agriculture by deciding what meat to buy. Saying Agriculture is just farming is like saying surgery is the only thing in the Medical Field. Well written! I was a state officer MANY years ago in Mississippi. I found your article as a Facebook post from a current Ag teacher that I originally befriended through FFA. I will always consider FFA as some of the top highlights in my life. Wonderfully encouraging to hear Perry! I hope FFA is a highlight of my children’s life also. Thank you! Great article. I couldn’t agree with you more. My brother has been a FFA Advisor and teacher since 1989; so our family has been intensly involved with FFA at the local level and at the state lever. I have been the Nebraska FFA Alumni Membership Secretary for over 15 years. I feel it is one of the most important organizations our youth can belong too. One thing as a nation is we need to encourage more youth to become Ag Instructors. 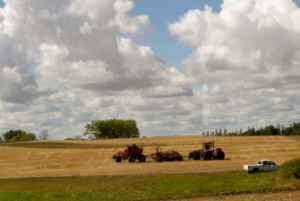 There is a nationwide shortage of educators for Agriculture. The job market for young people with any type of ag education is huge and there is more money in Agruicultural jobs that what teaching pays; so our young educators are choosing to leave education and pursue higher paying jobs in the agricultural job market. Thank you Tammie. The need for ag teachers is a topic I have thought of writing about also. We have 15 openings in ND right now without a next generation filling all the need. Every state is in the same situation I know. I appreciate you sharing! I just finished a career of 37 years teaching vocational agriculture (FFA) in the San Joaquin Valley, America’s food basket. Thank you for explaining to the general public those things which I took a great amount of pride in developing in our young people. And yes, I was an FFA member for 4 years in high school, with a State Farmer and Honorary American Farmer degree. I experienced the “sea of blue” jackets at national conventions in Kansas City, Kansas, Louisville, Kentucky and Indianapolis, Indiana many times and the thrill of hearing the inspirational speeches of the national officers, who always thanked their parents and God, gave me hope for the future of our country. As you stated, the CDE team experience is awesome, as I was able to relive FFA through the eyes and hearts of students, training them to win state and national championships as well as see those students go on to careers in the industry. Thank you Mr. Mann for your lifelong commitment to FFA and ag education! I appreciate you taking the time to read my post and share your story. Katie, I was a student of Mr. Mann’s, I was the young freshman who was lucky enough to have had Mr. Mann take me on his Agronomy team and teach me and my teammates that with a lot of hard work and dedication we could achieve our dreams. He helped us to become State Champions, but most important he showed us who we could be with a dream and hard work. I was our chapter President and did get to go to National convention, Wow, what an amazing experience. Though I did not go into Ag., I did go on to open my own business, which is now celebrating it’s 22nd year in business. I can tell you, that I owe alot of my success to what was learned through the FFA organization and the dedication of teachers like Mr. Mann.. All three of my children have been a part of the FFA and I am still an active supporter of FFA, Thanks for your article! Thank you for this!! So wonderfully written and enlightening! 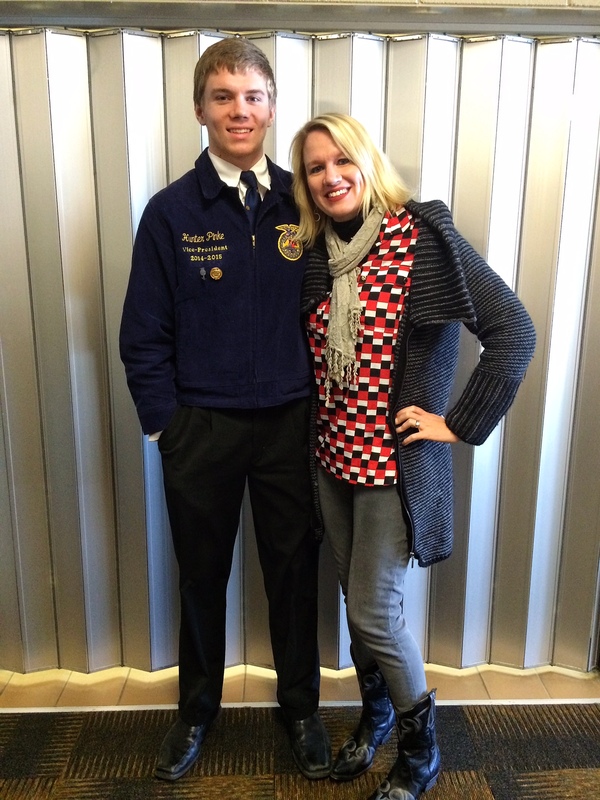 I’m the proud wife of a 25 year Ag teacher and FFA Adviser and now our oldest son is also wearing the Blue Jacket. For many years I’ve tried to explain what FFA provides to those who participate… this nails it! I can’t wait to share it on my FB wall this week during National FFA Week. Thank you!! Thank you Margi for your comment, commitment to FFA and excitement in sharing this post! I hope more parents will encourage their kids to participate in FFA and go into ag education also as a career! MY husband and I are both Ag teachers! We love the program, agriculture and all our kids! It has been so much fun to see the change in kids that start out as ninth graders and see the adults that they have become! Warms the heart! So many people look down on the Ag kids/FFA members because that’s a hick organization…that’s fine, we don’t mind being called hicks! It’s almost become a compliment!! Lol! Thank you for you and your husband’s commitment to ag education! Hicks? No way! You’re leaders of an encouraging, innovative organization. Thank you again! Not a FFA member but I grew up on a College campus with a complete AG education. So I played with and learned about animals in the real world. Values taught are a road map to success. One of my daughters became a Zoologist. But my greatest achievements are Four daughters, no divorces, ll grandchildren All started with farm values relayed from my father who grew up on a farm. Thank you for sharing! Farm values are rooted in FFA and definitely something to live by! No truer words have been spoken about FFA. My Husband is the National Superintendent of the CDE and I will say that FFA students are the cream of the crop!! Having been to convention several times I will say that I have never seen teens as well behaved, polite and hardworking as the 50,000 FFA students that attend! My prayer is that when the time comes our children will wear the blue and represent North Dakota proudly!! Lisa, thank you! I am a fellow North Dakotan. You and your husband’s commitment to FFA is appreciated. I agree on seeing the FFA teens as some of the most polite and hardworking I’ve ever seen! This is awesome! I’m involved in FFA, I live in the city, I’m an athletic, and I love it! This sums it all up! Andrea, thank you! Keep up the great work. FFA was the best part of my teen years! I made lifelong friends at livestock shows, judging events and conventions. The lessons leadership and team building have served me well. Shout out to the 1979-80 Louisiana State Officers! I love the community built around FFA, Laura! Thanks for highlighting it. Thanks for your comment, concern and passion Cassie. I am going to email you some contacts to help. We are are experiencing something similar with our FFA program in Campbell, CA. FFA seems like such a good opportunity for students, but our school’s program is extremely disorganized and is very disappointing. Not only is this chapter’s FFA not living up to what it is supposed to (based on the little I know), but the Ag teachers are not teaching! Instead class time is wasted on videos with nothing related to anything even remotely academic. As of date, my daughter purchased a commercial pig to raise at the school’s farm with no instruction on what to do, the type of pig, the age, how to properly clean the pen, find a buyer, etc. In a few days, it will be “harvest” time… Just sad the lack of education. She did learn some basics from other students who have participated in past years. Where can we find detailed information on what to expect from FFA? How to raise and sell the animals, proper selling prices, etc.? We are lost and I’d like to help the students get this turned around! Ag teaching is a busy life style and sometimes we do not have time to commit to every contest. As an Ag Teacher in California I would recommend you talk with you Ag Teachers first about the information you are looking for and your program concerns. Every chapter is required to have an Advisory Committee. Maybe you should find out if they need help on that committe. If that does not work, then you need to contact your Regional FFA Supervisor. Each region in California has a reginal supervisor. Go online to the Calaged.org website and you should be able to find out who that person is and their contact number and email. Many times I am contacted by parents that have questions regarding fair projects. The first thing I ask them is did your son or daughter bring home the specie fair handbook. Usually the answer is no. So I tell them to talk with their child and if they have lost it to ask for another. Most chapters have some sort of handbook for fair projects. I joined my freshman year of high school and immediately started competing in speech contests. I went to the national convention and later was part of our parliamentary procedure team. Now that I think about it I also competed in crop identification or something like that as well. I raised hogs and lambs through FFA and learned how the real meat market worked. FFA gave me the skills and confidence to become active in university committees and to go on to law school where I graduated first in my class. My experiences in FFA helped me earn a spot on moot court and eventually landed me a position clerking for a justice at the state supreme court. I went on to practice law in one of Michigan’s largest and most prestigious law firms. Now I manage an international program and teach the next generation of future leaders. None of that would have been possible without FFA. Ben, you are a shining example of exactly who I think FFA empowers. Thank you for sharing! As a former FFA member and now an Ag Teacher/FFA Advisor THANK YOU for sharing about our wonderful organization!! I teach at an inner city school where my students have little to no access to livestock so the “cows not required” phrase fits us! Good luck to your son on the rest of his competitions and thanks again! I completely agree. I was never a member of FFA (my high school didn’t even have it! ), but now I’m married to an Ag teacher who is an FFA alum and have seen first-hand all that you wrote about. FFA provides a place for all different kinds of students to belong, and teaches them skills that will prepare them for a successful future. I love FFA, I’m thankful for the role it had in my husband’s life, and I know that I’ll want my kiddos to be involved as well. My daughter attended two FFA banquets before she was 6 weeks old. As a kindergartener she had more “points” attending events than the high school kids. One holiday dinner at my parents, she took her mashed potatoes between her fingers (as she learned watching land judging practice as an elementary student) and said these have too much clay. Such is the life with an Ag teacher father. She recently changed her major to Ag Ed at UNL. My son is also active in FFA and will probably join the family tradition and be an Ag major at UNL. I am sitting here with tears in my eyes. Our daughter is finishing up her last “National FFA week” as her chapter’s president. She has come so far while being a member of FFA. The next chapter of her life will be majoring in Ag Ed at Iowa State. I can’t wait to see what she does there as well as after graduation. Her goal is to be an active and enthusiastic teacher and FFA Advisor. We are hoping she will find a good “fit” in a truly rural school where she can motivate her students to embraceand take advantage of everything FFA has to offer. Thanks for posting, Katie. I will be printing two copies as it is an awesome overview of FFA. My Dad and my Husband were in FFA. Dad raised hogs. My husband calves. My husband is 64 and one of our favorite possessions is his FFA ring. I had it framed several years ago and it hangs in our guest room. The jacket was worn out decades ago. Well said! My daughter is in her last year of high school and has been in FFA for 4 years. She has done SAE and CDE and has enjoyed every minute. But her favorite was participating in the Texas and National FFA Chorus for 2 years. This was something her advisor told her about that she would have never known. He said it was thinking out of the box of agriculture. Plus he knew she was in the top choir at school and thought it would be something she would like. But still a huge commitment when you are a part of something so big. She has gained long time friends from all over and enjoyed every minute. She has even became a leader without being a officer. I know that being a part of this organization has made her into the strong and respectful young lady she is today! ! Katie, Thank you for being spot on about FFA. We have a daughter who is an ag. teacher and a FFA advisor. Her 4 years of high school FFA enabled her to earn many scholarships for college and to gain the skills needed for college. Another daughter earned her degree in ag. business which gained her career in financial business. This year we have a grandson is his senior year of high school FFA ready to begin his college career in ag. science and ag. business this next fall. Our family firmly belives in the FFA and has seen the benefits of FFA.